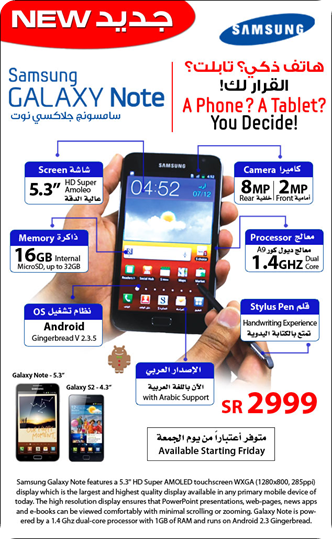 If you remember we have blog before that Samsung Galaxy Note is available in Riyadh. Now we would like to report that it is now officially available through Jarir Bookstore @ SAR 2,999. I will have to pass by Jarir, so we can test this unit and give our review. I have heard lots of good things about this phone. A smart phone Android Gingerbread Ver. 2.3.5 and with 16 GB Memory and Dual Core Memory is a perfect match for iPhone. I donâ€™t know if this is available in Al Batha. Its available in batha for 2300sr only very cheap than the unfair prices in jarir…..u check it out….